With four lactose intolerant family members, my family's milk budget is through the roof. This is why I am so excited that Aldi has a low price on regular milk. I am the only person in my family, who can drink regular milk, and the South Florida Aldi milk price of $1.99 (7/13/11 updated: $2.39) for a gallon (Sometimes $0.99 on sale) is a price that is hard to beat. Amanda from Saving Myself Silly reports that 1 gallon of milk is usually $0.99 in Dallas, TX, so some of you should get this fabulous Aldi price on milk most of the time. As for the milk it tastes just like any other milk I have tried, I usually buy the fat free skim milk for my breakfast cereal, and thanks to Aldi I no longer feel guilty about drinking milk, as the otherwise high cost of milk usually makes me prioritize getting milk for the kids only. One of the great things about our South Florida Aldi milk from Friendly Farms is that it is free of artificial growth hormones. That's a big plus in my book. I have; however, seen reports that not all Aldi stores carry Friendly Farms hormone free milk, so check the milk at your local Aldi store. A few of the Aldi price cuts for this week that will make the products cheaper than at the competitors. These price cuts should be at all Aldi stores. If you have ever had Haribo Gummi Bears you will not want to try any other gummi bears, because nothing will compare. My husband got addicted to Haribo Gummi Bears, during our years in Europe, and not even the kids will eat any other gummi bear that I bring home. The only problem is that Haribo Gummi Bears are more expensive than the other brands of gummi bears, so when I discovered that you can find the Haribo Gummi Bears at Aldi I was excited. 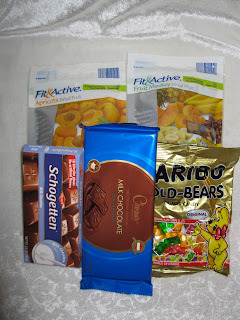 Until Aldi opened in South Florida, I would buy Haribo Gummi Bears at Walgreens, whenever they were on sale at 2 for $3, Target has a bag of Haribo Gummibears for $1.79, and sometimes they go on sale at $1.69, and of course our local European store, which has the best selection has them for more than $2 for a small bag. The Aldi Price on Haribo even beats Amazon's bulk price, as you can buy a 12 pack Haribo Gummi Bears, 5-Ounce Bags (Pack of 12) for $13.11 with free shipping, which makes each bag cost $1.09 - $0.20 more per bag than at Aldi. It is time for another updated Aldi Grocery Price Comparison list between Aldi, Publix, Target and Walmart. Donna from Madison Coupon Connection found some fantastic deals at her local Aldi Store (Madison East - Wisconsin), as she found hot dog buns for $0.10 each, Hamburger buns for $0.20 each and Split Top Wheat Bread for $0.50 each. These are the latest price changes at my local South Florida Aldi Store. The biggest price decrease was on 3 lb yellow onions, which had decreased to $0.99, and white bread has decreased to $0.89. The price decrease on bread was nothing compared to what Donna from Madison Coupon Connection found though, as she found hot dog buns for $0.10 each, Hamburger buns for $0.20 each and Split Top Wheat Bread for $0.50 each. Did anyone find similar hot prices on bread? The above Aldi price changes are what I found at my local South Florida Aldi store, but these should only be used as a guide, as prices vary from region to region. I would love to hear, if any of you found any fabulous price decreases, or some crazy Aldi price increases. Once I hear from some of you, I will make a similar diagram and linking back to your own blogs, if you own a blog. You can see last week's price change variations report here. Don't forget to check out the Aldi Price Comparison list, which is updated several times a week, as the new ads go out. I needed a semi-healthy snack to bring to the beach on Sunday, so Saturday night my four-year-old son helped me make banana orange muffins for our beach trip. Most Aldi Shoppers can be divided into three groups, but the one thing that all Aldi Shoppers have in common is that they want to save money. 1) The Loyal Aldi Shopper: Does not shop with coupons and buys everything that he or she can at Aldi, because it is easy, convenient and the prices are great. 2) The Sales Shopper: Shops sales, and usually has 1 or 2 other grocery stores that he or she frequent besides Aldi. 3) The Coupon Shopping Deal Hunter: This shopper is very aware of where to find the best deals, and most often he or she is an avid couponer, who combines coupons with sales to stock up at the lowest prices. The Coupon Shopping Deal Hunter will buy most products at a very low cost by combining coupons and sales at the regular grocery stores and drugstores, everything else he or she finds at Aldi because of the low prices. 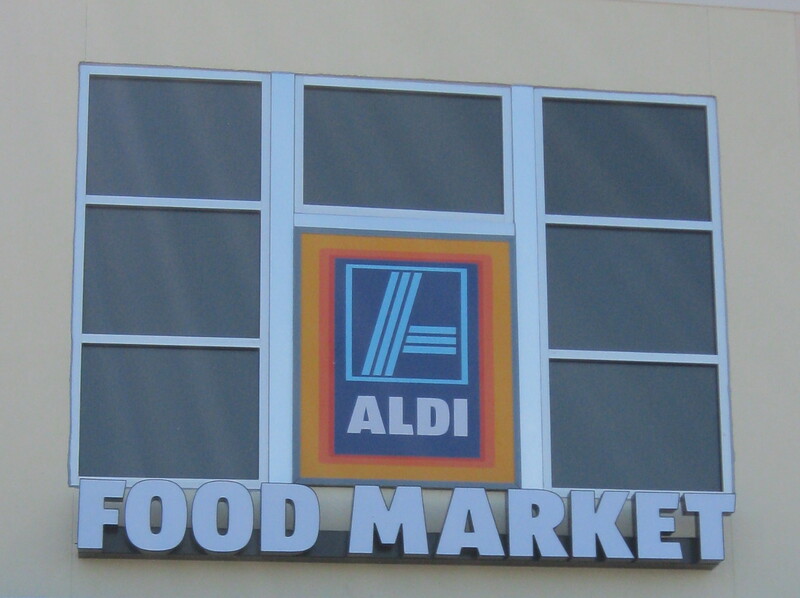 No matter what kind of Aldi shopper you are, you will be saving money by shopping at Aldi. Making meals with Aldi groceries can turn any meal into a very frugal meal, and here at The Aldi Spot I will be sharing simple Aldi recipes that you can easily make with products from Aldi. 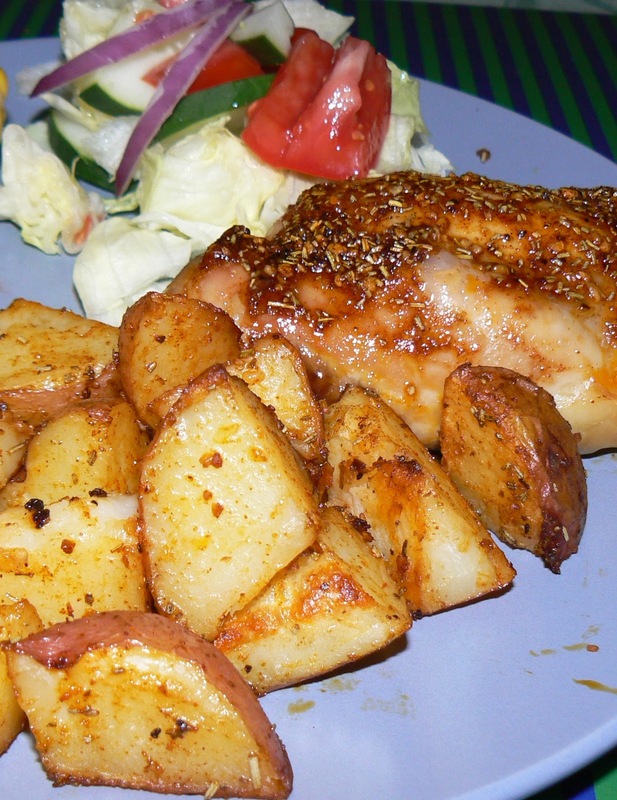 Today's simple Aldi recipe is Rosemary Chicken with Roasted Red Potatoes. One of my oldest son's favorite meals is Rosemary Chicken, and with Aldi ingredients Rosemary Chicken can be turned into a very cheap meal. The recipe is actually from a McCormick Recipe Inspirations that I received to review last spring, but while the Recipe Inspirations are very convenient, they sure are not cheap. At a retail price of $1.99 for the spice blend package, I can get chicken enough for the meal for less the cost of the Recipe Inspiration. It had been three weeks, since the last time I was able to stock up on my Aldi shopping trip. On my two previous Aldi shopping trips, I had to take the bus home, which means limiting my purchases. Our fridge was very empty though, in fact it was so empty that I could easily clean the fridge this week without having to move too much around. As an avid coupon shopper, I use Aldi to get the foods that I would not otherwise be able to get for pennies with my coupons. By shopping at Aldi for the staples I have been able to shave $10 - $20 off my grocery budget every week. I use the Grocery Price Comparison list to keep track of where to find the lowest prices on most products. When I got to the register I was sure that I would pay at least $60 for everything in the cart, but I was hoping for $50...see below what I ended up paying. Aldi Pineapples are on sale again, and they sure are tasty. Hot Aldi Price Alert: The Aldi price on pineapple is now at $1.69 for a fresh, sweet and delicious pineapple - it sure is hard to find any competition on this price. Price update: Dole Pineapples are $0.99 at some Aldi Stores. This particular Aldi pinapple, which I picked up at my local South Florida Aldi store is from Costa Rice, and it is a Rosemont Farms pineapple. I have purchased several pineapples from Aldi, and I have yet to be disappointed. However, choosing a pineapple is key when finding the best pineapple. 2) Look for a dark brown color, and make sure the leaves have a very dark green color. A ripe pineapple will be brown with very little green color visible on the hard surface of the skin. You need to look between the gaps of the thorns to judge. See the complete Aldi Price Comparison List. I went to Aldi this afternoon, and below you will find any new Aldi price changes that I observed during my Aldi shopping trip. This list was updated 1/19. You can find the entire Aldi ad at Special Buys. There were quite a few price increases, but several produce prices had been slashed. These price changes are all unadvertised, and they may vary by region. Pineapple $2.49 Minus $0.50 $1.69 Publix $2.99?? Naval Oranges $1.29 Minus $0.10 $1.19 Publix $2.99?? Check out the latest complete udated Aldi Price Comparison list between Aldi, Publix, Target and Walmart. Did you notice any drastic Aldi price changes at your local Aldi store?